Episode 3 of RICHES Podcast Documentaries: Serving the Community: The New Deal Post Office of Cocoa Florida. RICHES Podcast Documentaries are short form narrative documentaries that explore Central Florida history and are locally produced. These podcasts can involve the participation or cooperation of local area partners. In Episode 3, Heather Bollinger interviews Dr. Connie L. Lester of the University of Central Florida, Dr. Alan Bliss of Valdosta State University, and Dr. Nick Wynne of the Florida Historical Society about the history of the former Federal Post Office building constructed on Brevard Avenue in Cocoa, Florida. As of 2013, the building operates as the Florida Historical Society's headquarters. Original 25-minute and 50-second podcast by Heather Bollinger, March 1, 2011: "RICHES Podcast Documentaries, Episode 3: Serving the Community: The New Deal Post Office of Cocoa Florida." RICHES Podcast Documentaries, Orlando, Florida. 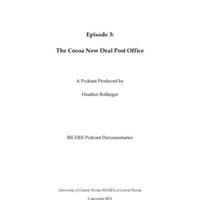 Digital typed transcript of original 25-minute and 50-second podcast by Heather Bollinger, March 1, 2011: "RICHES Podcast Documentaries, Episode 3: Serving the Community: The New Deal Post Office of Cocoa Florida." RICHES Podcast Documentaries, Orlando, Florida. Originally created by Heather Bollinger and published by RICHES of Central Florida. "RICHES Podcast Documentaries, Episode 3: The Cocoa New Deal Post Office." RICHES of Central Florida. http://deimos.apple.com/WebObjects/Core.woa/Browse/ucf.edu.2577623765.02577623773.6997974713?i=1630384584. Bradbury, Alford G., and E. Story Hallock. A Chronology of Florida Post Offices. 1962. Cutler, Phoebe. The Public Landscape of the New Deal. New Haven: Yale University Press, 1985. "The Society: Brief History." Florida Historical Society. http://myfloridahistory.org/society. Esperdy, Gabrielle M. Modernizing Main Street Architecture and Consumer Culture in the New Deal. Chicago: University of Chicago Press, 2008. http://public.eblib.com/EBLPublic/PublicView.do?ptiID=557563. Gallagher, John S. Florida Post Offices. Lake Grove, OR: The Depot, 1997. Helbock, Richard W. A Checklist of Florida Post Offices, 1821-1995. Lake Oswego, OR: La Posta, 1995. I’m Robert [A.] Cassanello, assistant professor of history at the University of Central Florida, and you’re listening to the RICHES Documentary Podcast. Welcome to the RICHES documentary podcast. RICHES, the regional initiative for collecting the histories, experiences, and stories of Central Florida, is an umbrella program housing interdisciplinary public history projects that bring together different departments at the University of Central Florida with profit and nonprofit sectors of the community in order to promote the collection and preservation of the region’s history. By facilitating research that records and presents the stories of communities, businesses, and institutions in Central Florida, RICHES seeks to provide the region with a deeper sense of its heritage. This series will feature a podcast every two weeks, in the middle and at the end of each month, that will explore various aspects of Central Florida history. In today’s episode, Serving the Community: The New Deal Post Office of Cocoa Florida, Heather Bollinger examines the history of the iconic building, now home to the Florida Historical Society. Hi. My name is Heather Bollinger. In this podcast, I explore the history of a former New Deal post office building in the City of Cocoa, Florida. Now the headquarters of the Florida Historical Society, the former post office served the community of Cocoa for 25 years, and brought a much needed economic boost to the city. From its earliest incarnation as a post office, the building has continued to adapt to the needs of a changing society, and has had lasting value for the City of Cocoa. This podcast will explore the factors behind the building’s construction, the impact of that construction on the local economy, and how the building continues to serve the community of Cocoa. At the end of the 1930s, the United States was struggling to come out of the Great Depression, the worst economic disaster to ever strike the country. President Franklin Delano Roosevelt’s administration developed the New Deal Economic Relief Program as a response to the Great Depression. The New Deal was designed to bring America out of the economic tailspin of the early 1930s and to prevent such a disaster from happening again. As part of the New Deal, designated funds would put people back to work, and restore confidence in the American economy. This involved the construction of many public works projects that would employ local citizens. Dr. Connie [L.] Lester, from the University of Central Florida, explains the goals of New Deal public works projects. Well, first of all, the government wanted to get Americans back to work. The unemployment rate in the Great Depression was around 25 percent. And in the South, that meant focusing attention on small towns, because although Florida had a number of urban areas at this point, um, still most Americans—most Floridians— were still living in small towns. So in order to get Americans back to work, you couldn’t just focus on the cities, you had to focus on the country-side, as well. And those projects were really important in getting, uh, people back to work. They built roads. They built bridges. They built schools and post offices. And in some places, they built airports. And those were ways to attract new investors. In fact, those small towns frequently pointed to, uh, their new post office, or their new school, or their roads, as evidence that they were modern and progressive. So that when they promoted their town looking for, uh, industrial investment, these projects became one of the centerpieces of their promotional literature. The passing of New Deal legislation had an important impact on small cities, such as Cocoa, Florida. A riverside city along Florida’s Atlantic coast, the City of Cocoa was founded around 1860 by fishermen and their families. Once a small town on the banks of the Indian River, by the 1930s, the City of Cocoa boasted a theater, a hardware store, a Masonic temple, department stores, and citrus growing facilities. What it lacked however, was an official government post office. The mail services had been housed in private residences and commercial businesses over the course of the town’s history, but the post office never had a permanent home in the City of Cocoa. However, the New Deal would change that. In July 1938, the [U.S.] Post Office Department and the [U.S.] Treasury Department, as part of New Deal legislation, appropriated $70,000 for the construction of a Federal Post Office building in the City of Cocoa. Dr. Alan Bliss of Valdosta State University explains how funding for the construction of post offices was implemented in places like Cocoa and what the government envisioned the post offices would stand for in the community. Well, the post offices came out of the Office of the Supervising Architect, which is part of the Federal Government that no longer exists. Uh, now we have the General Services Administration, which is sort of the landlord for all Federal buildings. Right really from about the time of the Civil War until 1939, the Treasury Department hosted a[sic] Office of the Supervising Architect, And that office was responsible for the planning and design of federal[?] buildings in the capitol in Washington, D.C., and wherever else the Federal Government did business. Each supervising architect was an individual appointed to that position, but a [U.S.] Secretary of the Treasury tended to sort of leave his, uh, imprint on the architectural style of the period, but of course, these people were products of their culture and their environment and their education. So you see Federal construction sort of reflecting the popular styles of the period whenever this development was going on. At the time that the Cocoa post office was constructed, um, as the cornerstone indicates, the supervising architect was a man named Louis [A.] Simon, he was an MIT [Massachusetts Institute of Technology] educated architect. Uh, he held that job, really through most of the 1930s in the Treasury Department. And in the case of post offices, like the Cocoa post office, there did tend to be sort of, uh, a governing philosophy, which was that the government should tend to favor architecture that was efficient and that reflected public purpose of the postal service. The news that funding had been secured for a post office was welcomed by the residents of Cocoa. In The Cocoa Tribune of July 2nd, 1938, the newspaper stated that “news of the funding for the post office is that biggest that has hit Cocoa in many a year.” And that the news should be “cause for great jubilation in our little city. “The community of Cocoa attributed the successful appropriation of funding to Congressman Joseph [Edward] Hendricks, who, according to The Cocoa Tribune, had submitted the need for a post office for Cocoa to the government with the resulting appropriation. The newspaper praised Congressman Hendricks for his hard work and urged its readers to do the same. At the cornerstone-laying ceremony on December 15, 1939, Congressman Hendricks was invited to make the principal address with all the fanfare of the Cocoa High School band and a parade down the main thoroughfare of the city, Brevard Avenue. Over one thousand people attended the cornerstone-laying ceremony. Dr. Connie Lester explains how citizens receive the news that their towns had been selected for funding and why many politicians associated themselves with the construction of New Deal projects. Most towns were very excited about it. When announcements were made about public works projects, um, they could be made in a variety of ways. Usually, the local politicians are gonna get involved. The newspaper’s gonna have—make a big splash about it. Um, sometimes you get—depending on the project and if it’s big enough—you would get a state legislators who—who would come, or even congressmen and senators who come. Because when something is going good like that, of course every politician wants to be in on it, and have people remember that they were there and that somehow they were responsible for it. So you always had, uh, a quite a bit of excitement about people coming to see the project get started and—and then when it’s finished, to see the end of it. On occasion, there were some projects that were so big like the TVA [Tennessee Valley Authority], for instance, um, that you would even of get, uh, visits from the President, who would come and open the project, or come up during some of the process of the project, to see how it was going. So, you know, people were really excited about these and I think it’s hard for us to conceptualize now how important this could be to a small town and to the—the people who hadn’t had much for a long time. The impact of funding for the post office was felt on Cocoa’s local economy. The land selected for the site of the post office was sold by the City of Cocoa to the Federal Government for $3,500, which was financially beneficial to the city. Though the project’s contractor, the J. M. Ramon Construction Company, was based out of Jacksonville, local labor was used in the construction of the building. Construction commenced in October of 1939, and was completed in April of 1940. Dr. Connie Lester and Dr. Alan Bliss explain how vital the use of local labor became in the construction of New Deal buildings, and the impact of that labor usage on the economy in places like Cocoa. Well, most of these small towns—people have very little money. I have a friend, who often says that in—in small towns everybody washed everyone else’s laundry. And what that meant was, they just went to each other's stores. They traded with one another. They bought, uh, and sold to one another. There was very little money in circulation in those small towns. What the government did by launching these projects is actually pay people in cash money, and that cash money became very important. But when you think about something like building a post office, like the one in Cocoa, uh, what you see is that you’re putting carpenters to work, and electricians, and masons, people who mix concrete, and truck drivers to move the materials there, heavy equipment operators to prepare the—the land in the first place. And all of them get paid, and they all get paid in cash money. And then that encourages other employment. Grocery stores do a better business. Department stores, furniture stores—so there’s all of those sorts of things. The point really was to get everyone back up and—and moving again. If they have money to spend and the demand increases for various kinds of consumer goods, then other people in the cities will go back to work. And so getting those small towns up and going was really, uh, really, very important, and had a huge impact on the local economy. These things really, uh, had a tremendous amount of resonance in the local economy. Well, there was the acquisition of the real estate for the property in the first place. And then local contractors were hired to actually effect[?] the construction. Those contractors hired their laborers. Uh, they also contracted with local vendors for building supplies and they contracted with subcontractors, um, for the specialized skills that wind up at a building just like that. Electricians, plumbers, tile setters, glaziers—who did the window work—roofers, uh, all of those things are specialties. They are construction traits. They tended to be done by people who are skilled in that enterprise. So the opportunity to work on a project, like a Federal post office was, uh, just about a God-send to people, contractors, laborers, skilled craftsmen, the contractors that supplied them. And then let’s not forget about the local building supply companies. Um, those tended to be highly localized—locally owned businesses. Lumber companies, uh, concrete supply companies, pipe suppliers, uh, all of these things tended to come from building supply businesses. Hardware suppliers and that sort of thing in the local area where buildings were under construction. You know what economists talk about it in terms of the so-called “multiplier effect.” It was really, uh, very much at work whenever a building like this led up. The design of the Cocoa post office really emphasized function over form. Located on the corner of Brevard and Orange Avenues, the Cocoa post office was in the heart of the main shopping district of the city. Dr. Alan Bliss explains how the architecture of the post office represented the important changes of the New Deal Era. The style is—let’s describe it in plain language—it’s spare. It does not have a lot in the way of elaborate adornment. Uh, it tends to be a, uh—a functional building. Some might actually go so far as to call it “plain.” I think it’s very, very handsome building. And it has a recognizable style that we tend to sort of associate with the New Deal Era. What you see here is pretty[?] sparelines[?] and something that is more popularly termed “Art Deco.” and I know architectural historians tend to hesitate to use that term. I’ve also heard it refer to as “Art Moderne.” And also I have heard this referred to as the so-called “International Style.” And it got that label in the early 1930s. It seemed as though there was kind of a widespread rejection of the old style classical design in public buildings—the old style monumentality. How come? People were turned off by the excesses of grand celebratory design in public architecture, because it seemed to evoke kind of the imperial aspirations of the, uh, crumbling regimes of Europe. After the Great War, people tended to recoil a little bit from that. People were very, very turned off by what they saw as the failings of those old imperial regimes. They welcomed, beginning in the 1920s, more modernist style. and I think that’s what we see in the Cocoa post office design—something that evokes the dignity of its public purpose and the security of, uh, the function that’s being carried out in the building. In this case, you know, the mail, right? But that really emphasizes function over, uh, ornate adornment. You don’t see a lot of adornment there—some nice touches. you know, the eagle there up with the stars that are cast into the facade, but nothing really, very grandiose. The Cocoa post office has had lasting value for the City of Cocoa. Serving as the town’s post office for nearly 25 years, the post office on the corner of Brevard and Orange Avenues was retired in 1966, after the completion of a newer, much larger building located on Orange Avenue in 1965. Between 1965 and 1997, the building was occupied by a variety of entities, including the military, and used as a recruitment facility by the Federal Bureau of Investigation [FBI], and also by a branch of the [U.S.] Department of Agriculture. In the mid-1990s, the Florida Historical Society acquired the former post office for the society’s permanent use. Dr. Nick Wynne, the Director Emeritus of the Florida Historical Society, describes how the building fit the society’s needs. Once we got it, we applied to the [Florida] State Historic Preservation Office and we got actually a couple of grants that totaled about 450,000 dollars. We renovated it and we kept all of the exterior, and we kept most of the interior, but we adapted it to become a library with the open spaces and—and to accommodate shelving and everything else like that. One—one interesting sidelight—when we were—first acquired the building, we went in and it had eight-foot drop ceilings. And the original height of the ceilings was about 40 feet. So we had to tear all of that out. And the FBI had occupied half of the building. And we’re not 100% sure, but when we were taking out the drop ceiling, we found 27 what we thought were microphones that had been planted and uh, trunkline that had like 200 separate phone lines coming in the building, because it was going to also serve as a FEMA [Federal Emergency Relief Administration] building. And we called Congresspeople and we called everybody to sing[? ], “You need to take out these phone lines, because they’re still active.” so eventually we just had the telephone company, “This is a construction zone. These lines will be cut.” So anyway, they came and they—they disconnected them to the building. It was interesting to say those were great days, because we were learning the building. We had never done and, uh, the building certainly accommodated us and was very spacious for the time. Since 1998, the Florida Historical Society has operated out of the former post office building. It is now known as the Library of Florida History. In many ways, the post office has become a recognizable symbol for the Florida Historical Society. The historical society serves not only academics, but also the public, and many social functions are held monthly for the local community. In this way, the historical society continues to give back to the City of Cocoa, Brevard County, and the State of Florida. Dr. Wynne explain what the building means to the historical society. It’s a historical building they built in 1939. Some classic architecture. It’s linked to Art Deco. I mean, it has just that appearance of being a substantial building. I think—becomes even more symbolic as far as being perceived as a permanent home. And the reality is probably we could’ve had any building and it would’ve been acceptable. But the—the reality is that this is an appropriate building for its function. But it became the symbol—very stately, I think, uh—a symbol of the society. For more information about the Florida Historical Society, please visit the society’s website at www.myfloridahistory.org. Thank you for listening to the RICHES Documentary Podcast. Feel free to contact us with any question or comments on the program that you just heard. Please join us for the next episode Gentrification and Urban Renewal: Revitalizing Central Florida’s African American Community. Bollinger, Heather. “RICHES Podcast Documentaries, Episode 3: Serving the Community: The New Deal Post Office of Cocoa Florida.” RICHES of Central Florida accessed April 21, 2019, https://richesmi.cah.ucf.edu/omeka/items/show/2455.